So in September last year we commenced with this plan, with his run speed off the bike as a main priority. The 15week period from September to January had Stephen running 3 quality runs a week plus the long run. In the 10km phase, the emphasis was on 3 elements, 1 threshold session, 1 shorter quality fartlek set with surges targeting 10km to 3km TT pace, plus basic speed surge intervals as part of an easy run. Then from January we moved to our traditional Race phase program maintaining the gains made in the run from the previous 15weeks. Stephen had a solid swim PB, rode 8mins faster than he has before, and ran very well off the bike, considering the effort Stephen put in on the bike and the heat of the day. A couple of things Stephen mentioned during our coach/athlete post- race review also confirmed the plan worked. 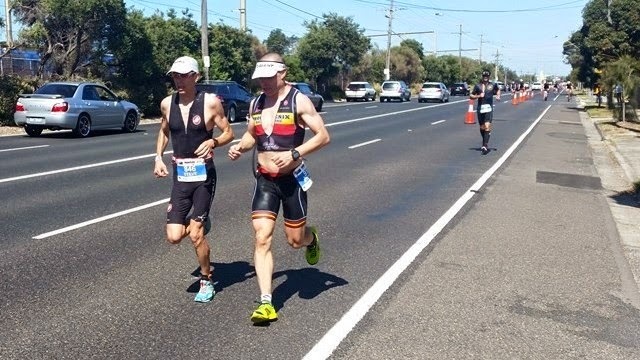 Obviously we had a planned intensity for the swim and bike, and on the run to utilise fresh legs early in the marathon whilst Stephen had them. He was holding sub 4:00min k pace early in the marathon, which was surprisingly quick considering he had pushed the bike leg hard, but it was in the right HR zone so he pushed on. His fast early leg speed confirmed his pre specific phase run training had worked well, and once the accumulated fatigue settled in on the second half of the marathon, Stephen was still able to maintain a strong pace to finish off the event, making up a number of positions late in the marathon. It was a great result with improvements across all disciplines, but mostly it is testament to Stephen’s application over time and his confidence in the program. Great stuff, Sean & Nugget!